Vienna is the capital of Austria and whether you are interested in culture, architecture, museums, markets or great food and traditional coffee shops, Vienna offers a wide range of great sights and attractions to its visitors. Above all, the historic center has rich architectural ensembles, including ancient castles and historical gardens and lots of unique charm. Most famous is the Ringstrasse, lined with prestige hotels, imperial buildings and stunning monuments. In this article you are going to learn more about the most popular sights, attractions and must see´s of Vienna. 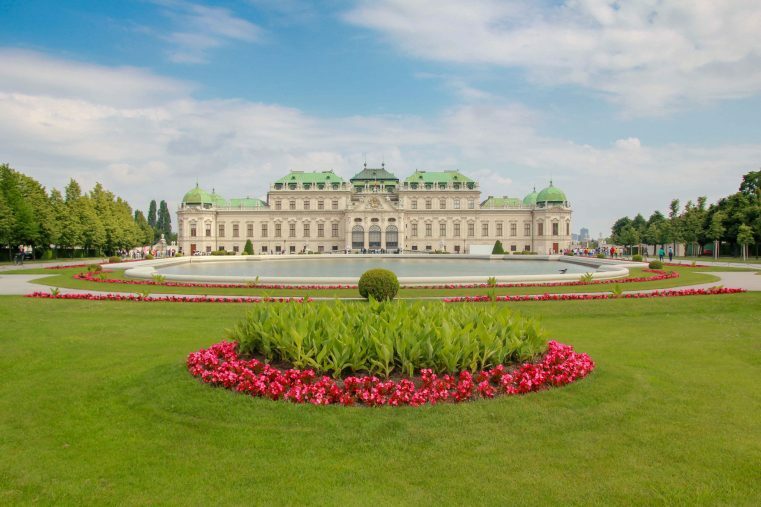 The Belvedere Palace is a huge baroque castle complex including the Lower Belvedere, the Upper Belvedere and a hauntingly beautiful gigantic garden area. Art lovers should definitely visit one of the world-class art collections inside the Belvedere. Even the world known Gustav Klimt’s Kiss and Judith, masterpieces of early modern art, are displayed inside the museum. Vienna City Hall is the seat of local government of Vienna, located on Rathausplatz in the city center. The building itself is outstandingly beautiful and a vast number of amazing free events e.g. Christmas markets, concerts and the summer movie festival take place at the Rathausplatz. Christmas season is the best time to visit as the place will be decked out in lights and Christmas décor and a huge ice skating ground will be open. 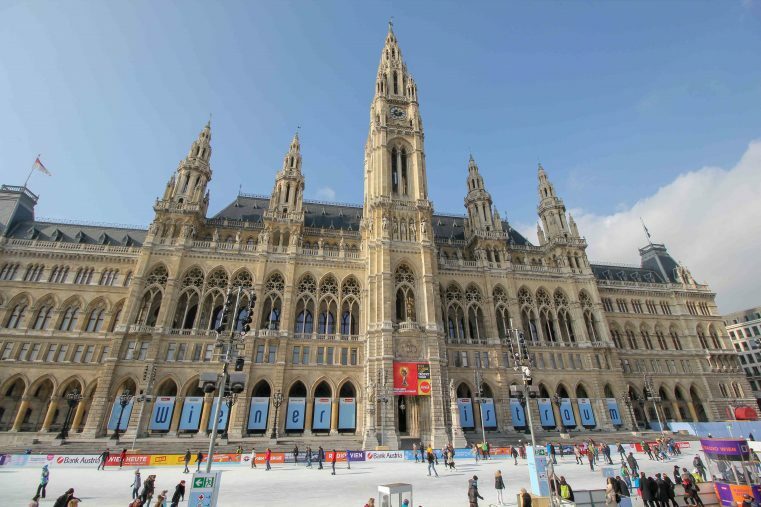 The Rathaus is one of the best photography locations in Vienna. The Burgtheater is the Austrian National Theater and belongs to the most important German language theatres in the World. Created in 1741 the theatre has a glorious history. If you would like to learn more about the theater you definitely should take a guided tour, starting daily at 15:00. 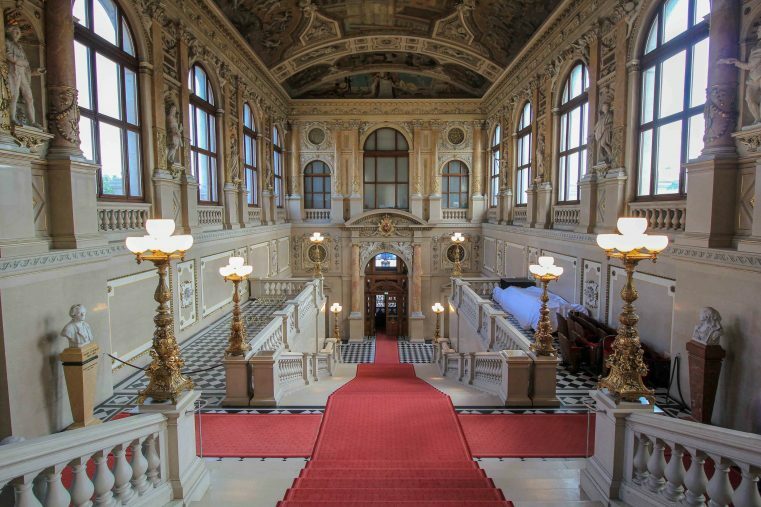 There you are going to have the chance to see the imposing grand staircase and the famous ceiling paintings by Gustav Klimt. The Natural History Museum exhibits over 30 million objects, from insect to gemstones, minerals, fossils, skeletons and a huge dinosaur hall. The ultimate showpiece is the 29,500 year-old „Venus von Willendorf”. and the huge collection is one of the most important in Europe and definitely worth a visit. Just on the opposite side you are going to find the Art History Museum. 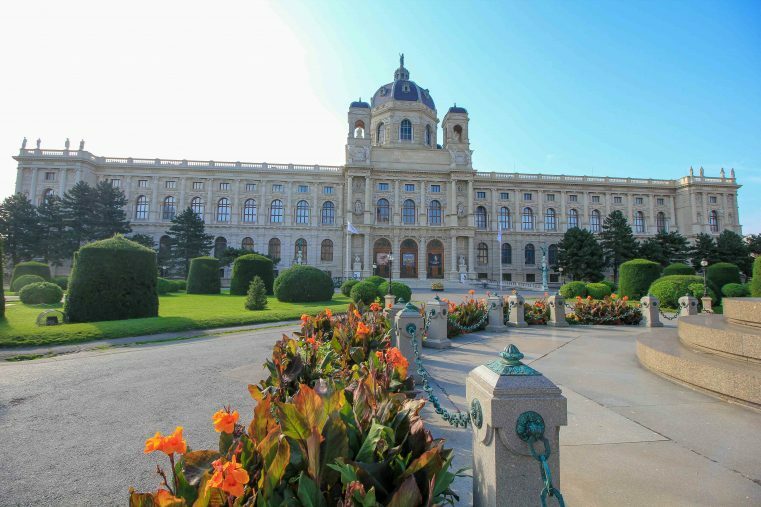 It’s well known for its fascinating treasure chambers and cabinets of curiosities of the Habsburgs. Also numerous major art works of European art history are displayed inside this museum. Vienna’s Opera is an outstandingly beautiful building and is located centrally in the first district. It is considered one of the finest Opera Houses in the world. Every night you can enjoy the very best in first-class productions and actually this year the Vienna State Opera is celebrating “150 years of the Opera House on the Ring”. 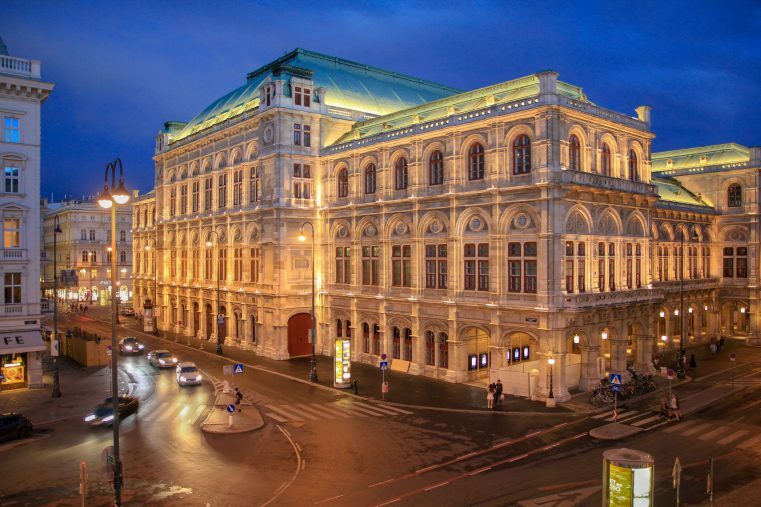 At night the Opera is stunningly lit and best you enjoy the view from the top of the Albertina passage. Visiting the Opera at night is drop-dead gorgeous and surely one of the top things to do in Vienna! 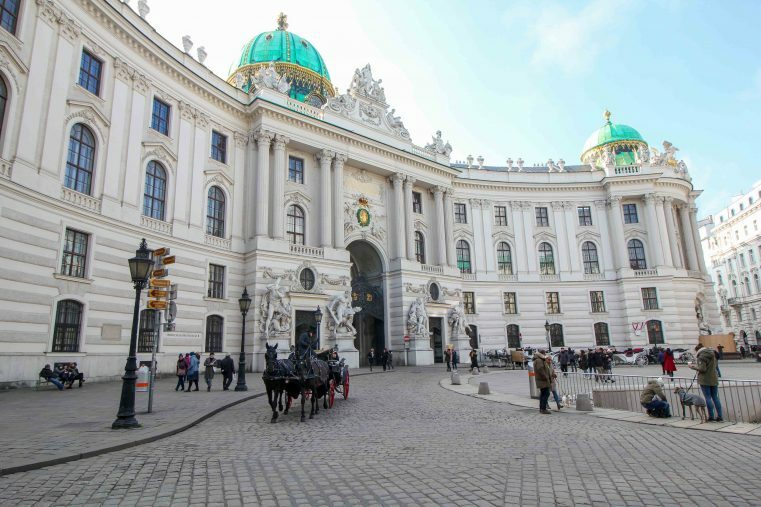 If you are visiting the Hofburg or the Spanish Riding School, you are going to cross this grand Baroque square for sure. Take some time and rest, it’s a great place to watch the traditional Vienna fiaker passing by and to admire the stunningly beautiful architecture. 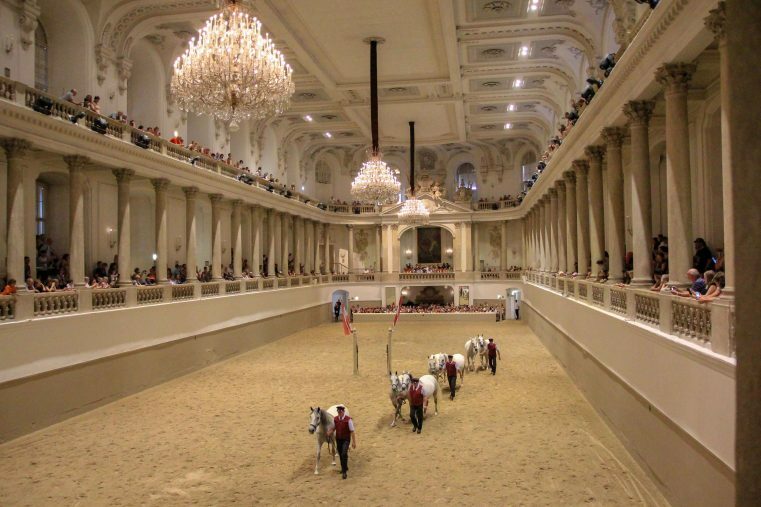 The riding school was built during the Habsburg Monarchy and the world famous white Lipizzaner’s offer highest standard of horse-riding art in a unique location. Visiting a show accompanied by classical music and watching the horsemanship is an unforgettable experience and definitely a must see in Vienna. Our tip: If you want to see the stallions and the noble horses for free and you can peep in at the Stallburg at Reitschulgasse 2! Check out Lipizzaner stallions at the Spanish Riding School in Vienna for more information. The Prater is Austria’s most famous amusement park. Visitors are going to find different attractions like adrenalin rush pushing carousels, rollercoasters and ghost houses as well as nostalgic rides on the famous Giant Ferris Wheel. Showing off, there is no entrance fee to pay, guest just have to pay for the attractions they want to ride. 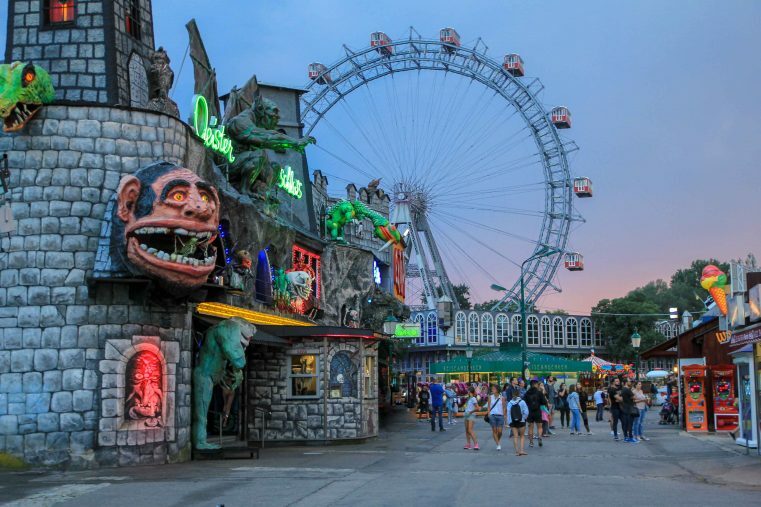 Exploring the nostalgic Prater amusement park and eating typical Viennese food like the Schweizerhaus Stelze or a Vienna Schnitzel is for sure one of the top things to do in Vienna! The impressive Schönbrunn Palace and its breathtaking beautiful gardens belong to the most popular sights in Vienna, and rightfully so: Schönbrunn Palace displays many piece of art, antique furniture and jewelries of the Habsburg family. Additionally, we highly recommend to walk up the hill to see the Gloriette. From the top you are going to have incredible views down to the palace and to Vienna town. 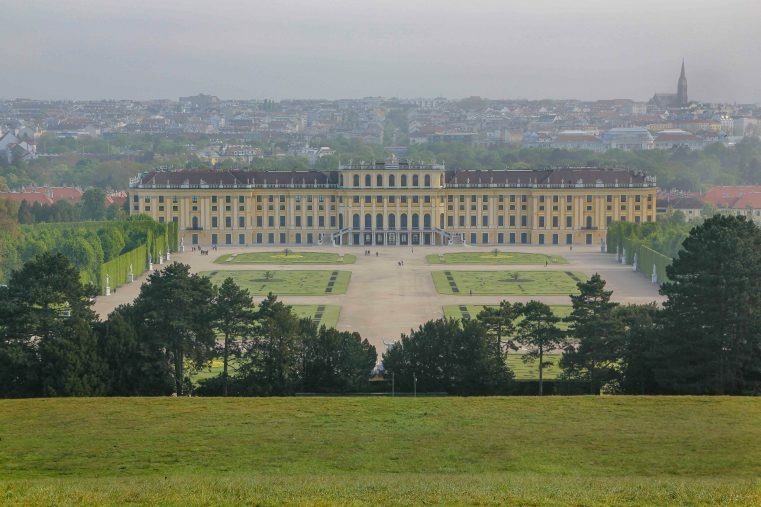 Also interesting are the picturesque garden area with the phenomenal “Palmenhaus” and the Schönbrunn Zoo, which is the world’s oldest zoo founded by the Habsburg family. The entire area is part of the imperial summer residence and is even listed as an UNESCO world heritage site. Another great thing to do in Vienna is to visit the State Hall. It was built in the 18th century and the baroque hall is a breathtaking 80 meters long and 20 meters high and exhibits over 200,000 tomes. Among the exhibits are four imposing Venetian baroque globes. The Graben is one of the most exclusive shopping streets in Vienna’s first district (city center). Visitors will find exquisite enterprises and modern shopping temples. This historic street dates back to the roman times and nowadays it’s surrounded by popular alleys, places and buildings which stand for the typical Viennese flair and elegance: Freisingerhof and Trattnerhof, Ankerhaus, Stephansplatz, Peterskirche, Kohlmarkt, Naglergasse, Tuchlauben and Petersplatz, Palais Bartolotti-Partenfeld, Generalihof, Grabenhof, Erste österreichische Spar-Kasse, Pestsäule and Fountains – all these points of interest can be found at Graben. 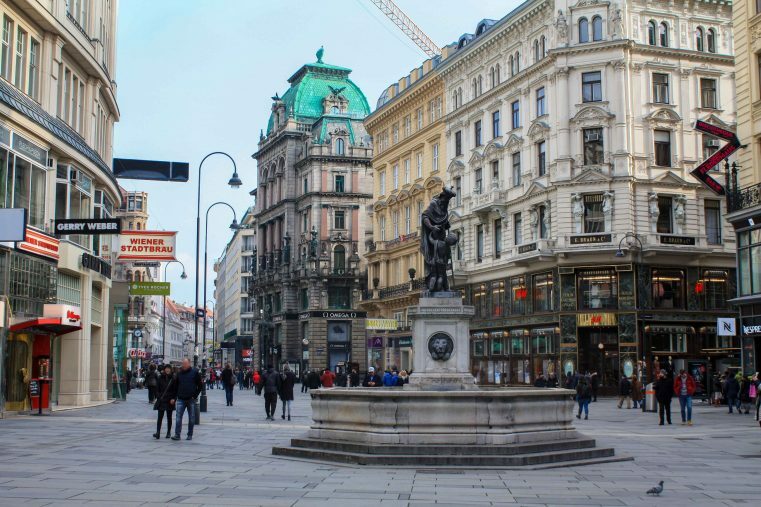 Window-shopping at the Graben belongs to our list of the top things to do in Vienna. 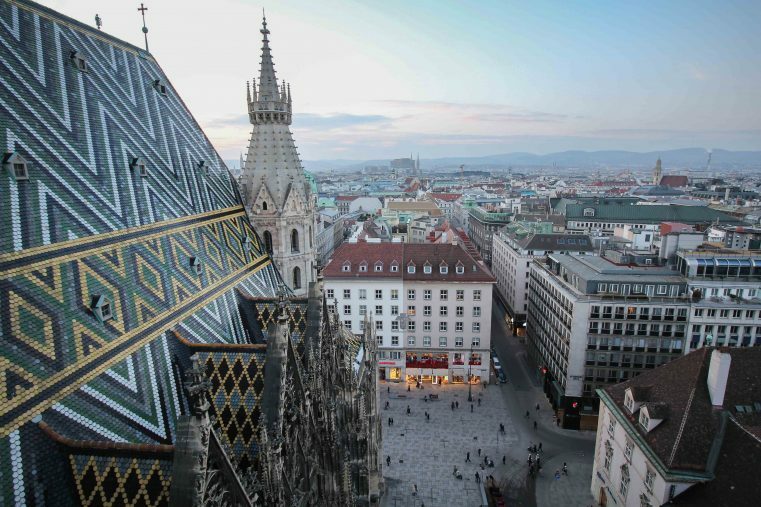 The St. Stephen´s Cathedral is Vienna’s most famous landmark and one of the most important gothic churches in Austria. The cathedral’s interior can also be visited and is free of charge. If you want to enjoy a fabulous view form above you should climb up the stairs to the south tower or take the elevator to the viewing platform at the northern tower (Pummerin). The picture below was taken from the northern tower. Seeing the city from up there is a must do for every visitor of Vienna. 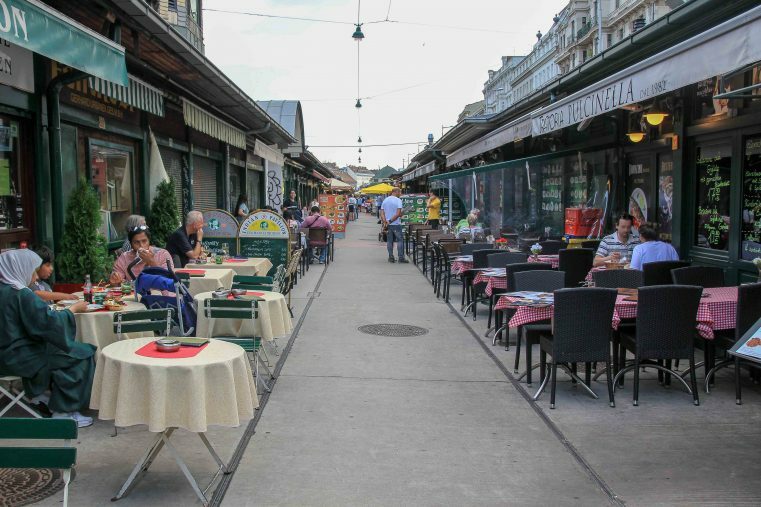 A “must see” attraction is the popular Naschmarkt in Vienna. The open market has around 120 market stalls offering all types of exotic fruits, fresh vegetables, tasty cheese and meat products. It also offers a wide variety of restaurants from typical Austrian, Italian, and Oriental to Japanese, Chinese and Indian etc.. The market is a great choice for having lunch and a meeting point for both locals and tourists. Every Saturday morning the traditional huge flee market takes place just next to the Naschmarkt. The Imperial Crypt also named the Capuchin Crypt, is a burial chamber beneath the Capuchin Church and monastery in Vienna. 149 members of the Habsburgs dynasty, i.g. 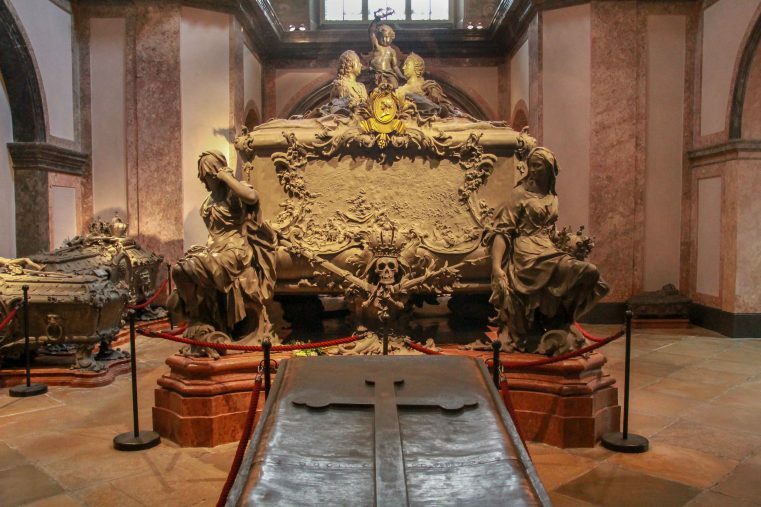 Franz Joseph I., Empress Elisabeth and Crown Prince Rudolf have their final resting place here and visitors can observe the magnificent free-standing tombs. 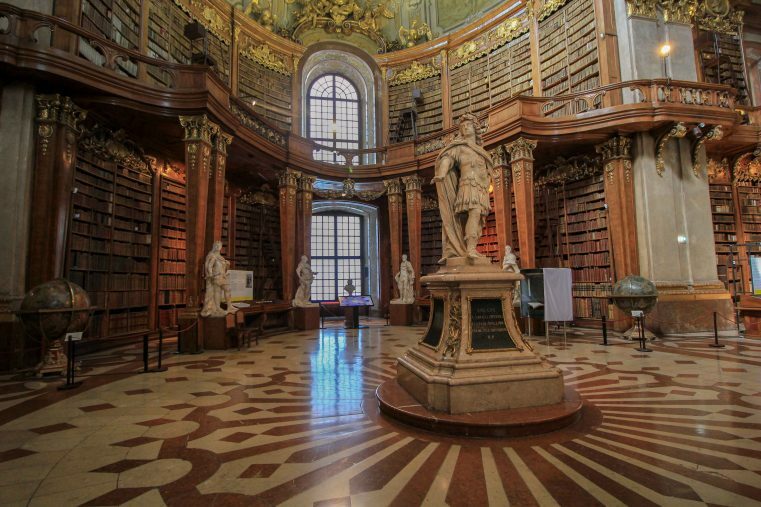 Truly an amazing historical place for those who are fans of history and for sure one of the top places to visit in Vienna! 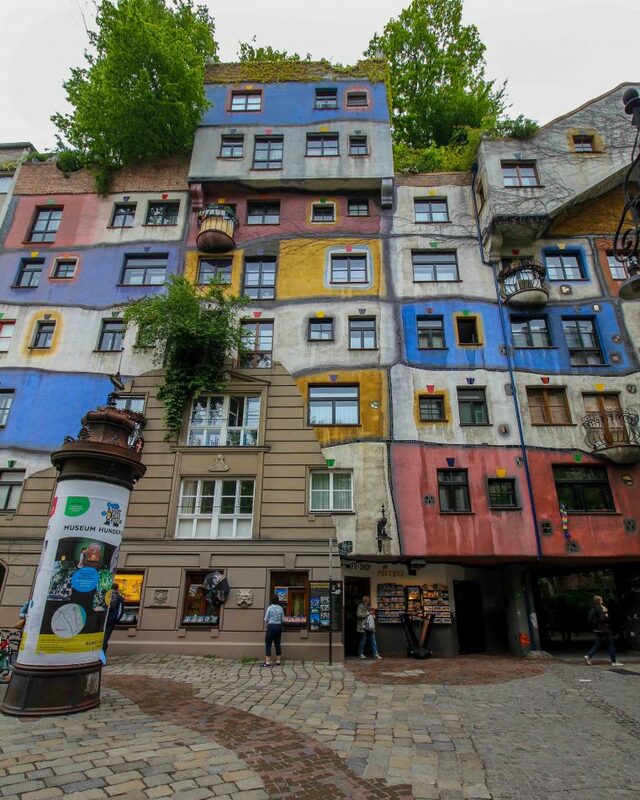 The Hundertwasserhaus is for sure one of Vienna’s architectural highlights and one Vienna’s best tourist attractions. This colorful and magical building was designed by Friedensreich Hundertwasser and constructed between 1983 – 1985. The Hundertwasserhouse can only be viewed from outside but the exterior façade draws attention to itself.